I haven’t really taken any English courses since grade school, so I decided a refresher course on linguistics was in order – especially after seeing the new Star Trek movie where Uhura mentions Xenolinguistics as her major. 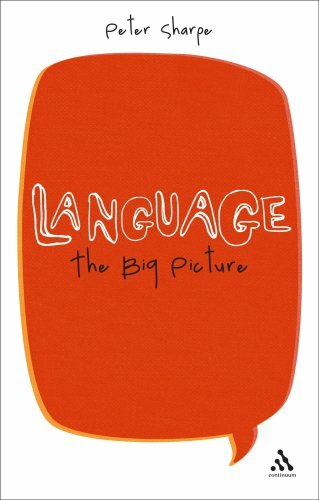 To that end, I checked out Language, The Big Picture by Peter Sharpe because I wanted a book that was a general introduction to the field. It IS a good survey of the research in the field. Sharpe begins with the origins of language and how our anatomy is related, and then moves on to why language change over time and variations by culture. He discusses Noam Chomsky, who was the biggest influence on linguistics in the Twentieth Century, and various theories of how language is structured. This is followed by a survey of semantics – how meaning is formed, and a discussion of semiotics, the symbols and signs of culture. His final wrap-up talks about the mental representation of language. I’ll be tackling Through the Language Glass: Why the World Looks Different in Other Languages next. I also found this video by Lera Boroditsky to be quite fascinating. In the meantime, does anybody have any good suggestions for an introductory text on Linguistics?